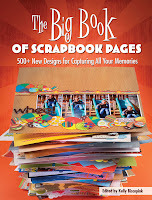 I've got a great scrapbooking idea book for you and the title pretty much says it all. 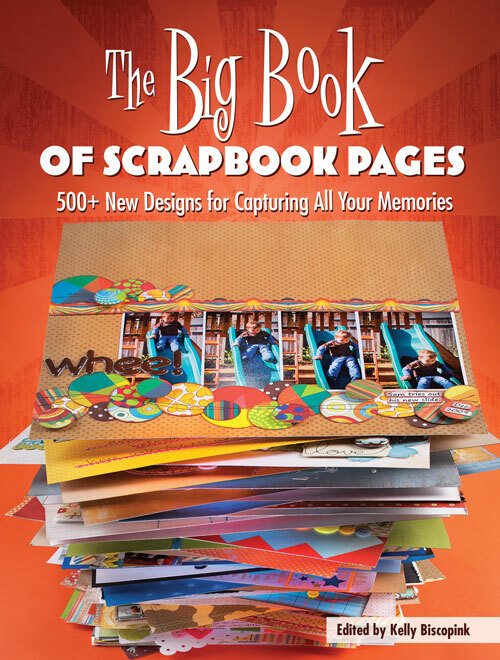 The Big Book of Scrapbook Pages: 500+ New Designs for Capturing All Your Memories is the newest edition from Memory Makers books and is over 250 pages (well beyond the size of your average idea book) of pure EYE CANDY!!! If you are looking for an editorial or instruction heavy edition, I'll tell you right now that this isn't it. While there are brief 'Inspired Ideas' boxes on almost every two-page spread calling attention to or further explaining a particular technique, design or product usage, this idea book's focus is on VISUAL inspiration. Just about any event or theme for which you could desire some inspiration is included in this huge collection. If you are a sketch fan, there is also 6 pages of single and double page sketches at the end of the book. If you have favorite scrap artists, it will be easy to find out if they have layouts included as there is a index of contributors at the back of the book with page numbers where their layout(s) can be found. And there's still 496+ AMAZING designs to inspire! The Amazon.com product page has its common 'Look Inside' feature if you like to take a look at a little more of what's inside the covers of this great book. I have one free copy of this amazing collection of eye candy available to give away to one lucky reader. Simply leave a comment to this post by 5 p.m. on Thursday, June 9th, 2011.